In Maine, it is commonplace for residents to embrace the sentiment “work hard, play harder.” This can be said for Freeport resident and Maine Crafts Association member Ned Merrick. A master woodworker, businessman, husband, and father, who is one of twelve dedicated owners in Maine company Winterstick Snowboards, Ned has been working hard with his hands and embracing the Maine play-harder lifestyle since childhood. What started as curiosity in his father’s woodshop became a way of life beginning in adolescence, when Ned took a job as a carpenter in high school. 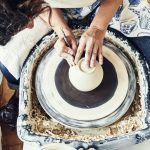 After sailing to various destinations around the world with a boat delivery crew and attending Skidmore College in upstate New York, he opened his first solo business in his hometown of Freeport. At Harraseeket Woodwrights, Ned specialized in building high-end custom kitchens, bars, furniture, and cabinetry for residential and commercial properties throughout Maine and New England. After years of success with his first venture, Ned purchased Freeport-based Day’s Hardwood and expanded his expertise into the area of providing raw local and exotic hard and soft woods. Ned sold Day’s Hardwood to another woodworking enthusiast upon the arrival of his newborn son in 2017, to focus on family and his own craft. In the present stage of his career, Ned still creates one of a kind, handcrafted “built-ins” for homes and businesses, including the white-stained ash customer service counter at the Maine Craft Portland store, designed by Caleb Johnson Studios. 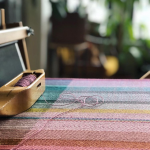 Ned also serves the craft community as a teacher’s assistant at the Haystack Mountain School of Craft, the institution that introduced him to the Maine Crafts Association, and serves as his creative home away from home. 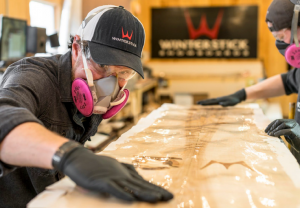 With Winterstick Snowboards, Ned and his team of co-owners and production staff design and build ethically sourced, eco-conscious, high-end wooden snowboards that are individually handcrafted from start to finish. All parts of Winterstick boards are supplied by companies in Maine or the greater United States. Winterstick, established in 1973 by snowboarding pioneer Dimitrije Milovich, is a true lifestyle brand, with its production factory nestled within the slopes of Sugarloaf Mountain in Carrabassett Valley. It is the only snowboard factory in the world with a chair-lift that runs directly to the back door, a living example of Maine crafts-people’s work hard, play hard attitude.